Award winning Granola - with Fruit. Wheat free toasted breakfast cereal, packed with toasted whole oats, nuts and seeds, our cereal makes a healthy and wholesome breakfast or nutritious snack at any time during a busy day. For that perfect breakfast, try it with fresh fruit and yoghurt. 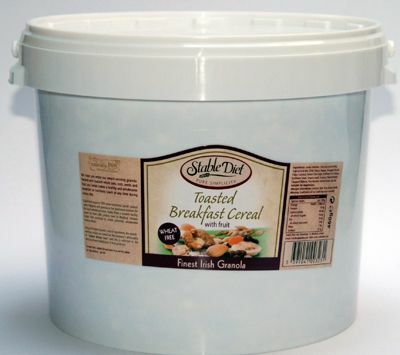 This 3kg tub is popular with catering outlets and also private customers. Jumbo Oatflakes (total oat content 46%), Tropical Fruit Mix (20%) (Raisin, Papaya, Pineapple, Banana Chips, Coconut), Brown Cane Sugar, Sunflower Oil, Oatbran, Sunflower Seeds, Sesames Seeds, Coconut, Flaked Almonds, Chopped Walnuts, Pure Bourbon Vanilla Extract, Sea Salt. Suitable for vegetarians.